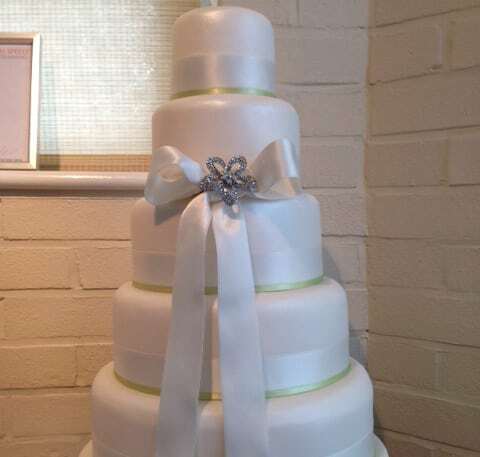 I’m currently working on a new cake called “Vivienne”; a stunningly simple, elegant, 5 tier wedding cake, plain white icing with a pearl lustre to give it a shimmer and finished off with white satin ribbon, over-laid with a thinner pale green satin ribbon just to add a touch of colour (of course the colour of ribbon could be changed to match your colour scheme). The great thing about this wedding cake is that it will serve 210 finger size portions (or you could change it to a square cake and have 275 portions!) so if you have a large guest list but not a huge cake budget then this style of cake is perfect for you. Bookmark this blog for the photo coming soon!